So your kid wants to be a princess. But not just any princess; a princess whose hair glows when she sings. Alright, so we haven't worked out how to make a wig glow yet, but we figured the rest of Rapunzel's tresses out! Which, trust us, was plenty of work. Golden hair 70 feet long? Yeah, there's a reason Flynn called over the little village girls to help with Rapunzel's hair-do. So if your kid is determined on being the princess with the long lustrous locks, look no further than our Rapunzel Wig with Flowers. 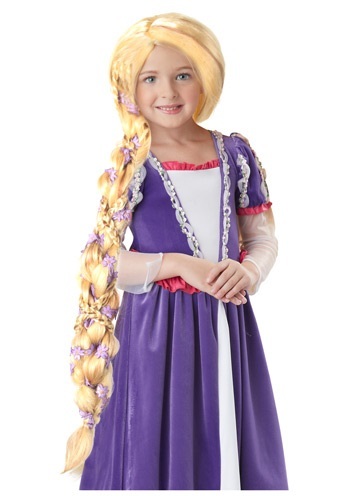 This long blonde wig has already been neatly braided and woven so it's easy for your princess to enjoy the festivities without getting hair trampled on. And there's even pretty violet flowers! Which is ten times better than following your princess around all evening bundling up her hair in your arms. Braids: who knew, right? beautiful , it is like the photo, very good quality, my daughter stayed fascinated with the wig. Flowers are gorgeous and the hair is the right color. Also comes with blonde bobby pins to help secure it on your her. came earlier than expected and is of good quality. Fits adults.